Hobbies: Having attention lavished on me by adoring fans. I am a famous artist. I paint with my paws. Favorite Foods: Cheese cubes and cheeseburgers. Goals: To raise funds for the Rescue and raise awareness of the puppymill/petstore connection. 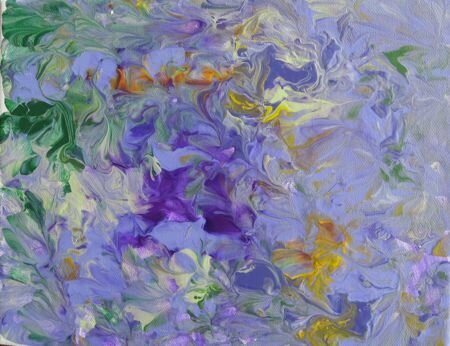 Sales of my artwork help support the homeless dogs at the Rescue. Dislikes: Cameras and camcorders. Everyone wants to see me paint but I can detect any camera and I go on strike! I also scrinch up my face and look away. Biggest Fear: Floors. I’m a puppymill survivor and didn’t know what life was like outside a cage. I never learned to walk on a real floor until I was almost grown up. 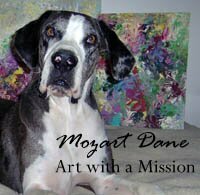 Follow Mozart on twitter at @mozartdane and check out his website at hhdane.org/mozart. Paintings like the one above are available on the site and all proceeds benefit the Rescue dogs. has such a sweet personality. me–and he’s a great and sensible pal. blog, and many other things (he makes me feel tired!). she does and she’s a caring and supportive friend. AND all of the above pooches support Rescue! Awe, thanks for the #followfriday love Mozart. You’re one of my favorite great dane pals. This is a really lovely profile of you, Mozart! And thanks for the #followfriday recommendation. You’re one of the most caring dogs out there.